in too many approaches and quick departures. When neighbors in City Heights talk about going home, that home may be as close as Los Angeles or Tucson, or as far away as Vietnam, Eritrea or the Philippines. My neighbors have family in Mexico and make an annual December pilgrimage to Mexicali or Oaxaca so that their children can spend Christmas with their grandparents, their abuelos. Distance, which translates into time and money, and unstable political circumstances in one’s home country are limiters on whether the wish to return home for a visit is ever realized. But beyond those considerations, can you go home if your home no longer exists? A few weeks back I spontaneously decided to book a flight to Philadelphia, to celebrate my oldest nephew Charlie’s fiftieth birthday with his wife and son. We were both born and grew up on the western, opposite side of the state. My parents are long dead now and the family home long gone. It is not possible to go home again, but I was looking forward to spending time with family. Yet I feel that I indeed went home. When Charlie met me with open arms at the airport, I emerged from his embrace reborn as Annie, the name I am known by with my family and with no one else. Home is the secret language of pet names and certain words and phrases that have become short hand for a shared history and when spoken are guaranteed to make everyone laugh, roll their eyes or groan. When you go home you talk. You talk about family into the wee hours of the night. When you go home you eat. You eat special foods. I had requested SOS and Charlie served it up for breakfast the following morning. It was a salt laden soul satisfying gustatory experience. For the uninitiated, SOS is thinly shaved dried beef in a medium white sauce served on toast (white bread). After eating this meal one is theoretically prepared to plow the lower forty acres before lunch. I was prepared to talk about family for the next seventy- two hours– after I unbuttoned my jeans. Home is also about a certain geography. The suburban community where Charlie lives looks much like the rolling Appalachian foothills where I grew up, sans the plaintive wail of train whistles echoing up through the hollers. The second day I was there, I stood outside on the front porch and heard what I at first thought were turkeys calling. The sound grew louder. I looked overhead and saw the unmistakable V pattern of Canada geese unzipping the soft grey belly of the winter sky, loosing—snow! I had not seen snow for decades. I grew up with it, shoveled paths through the loathsome stuff that would equal the circumference of the earth and happily left it behind with no regrets. 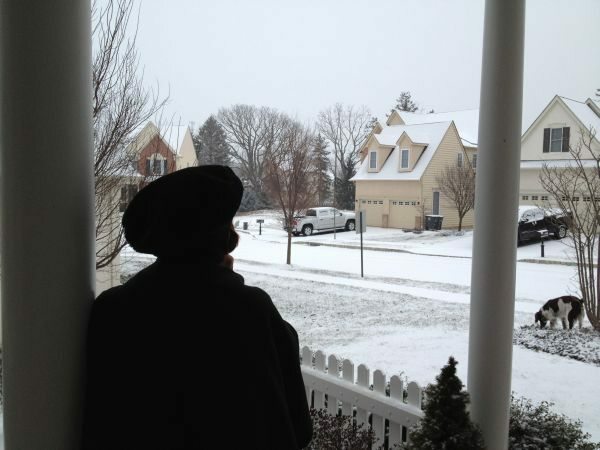 “If I never see snow again, it will be too soon….” Yet there I stood, deliriously happy at the sight of the falling snow. It was eighteen degrees and snow was falling. It kept falling all day. Standing on the porch I looked across white roofs at trees etched black against the sky. In my growing up years, I was able to identify trees even in winter, when only their bones were visible. I tried to remember, but my memory was as blank as the landscape. It was so cold and dry that the snow squinched beneath my feet. Yes, I remembered that particular sound of snow and the familiarity brought a flash of joy. At dusk, when the first house lights came on, the snow caught the light and turned to glitter. I felt as though I were a tiny porcelain figure frozen in a state of perpetual awe inside of a snow globe. We spent evenings poring over old pictures, each one of us stopping at various points to recount some story. Many of the stories had been told numerous times, others provided unexpected revelations. Our fingers gently traced the contours of our younger faces, the smiling faces of family members now dead. We breathed life back into them and filled the room with their presence. And wept. And laughed. Perhaps I shouldn’t be surprised at my realization that home is not some fixed point in space. What we remember– and what we forget, assure that the cartography of the human heart will always be inexact. For all of us, who love in time, our task is to continue to elaborate our heart’s unknown edge. Home is where the heart is, and not necessarily where the A-frame structure is located. Quite right Andy. Home is a moveable feast. Beautiful, Anna. It made me wish I had someplace other than Los Angeles to go back to. Judi- I envy you if a two hour car trip takes you home! A description of my 20 hour return trip to San Diego, which included a gut churning white knuckle landing in icy Chicago, a cancelled flight to San Diego and a long cold night spent in the Los Angeles airport, would have made the account of my journey home much less… rhapsodic. Someday I’ll have to tell you about the trip home from a pre-season game in St. Louis when I was with the Chargers……Imagine the detour to a mostly deserted and closed Los Angeles Int’l, only with over 150 people being stranded at 3am for better than five hours after an aborted landing attempt in San Diego (North Island)……It was an interesting experience…..although yours was a bit hairier because you were on your own…. The journey itself often becomes part of the story. Sometimes memories of the journey eclipse those of the destination. So yes, we must swap stories Andy, on terra firma. The more firma, the less terra. The more firma, the less terra-ble, Anna. DAMN the airlines these days — high prices, scrunched seating, no pillows or blankets or food, luggage fees, bumping, delays….But if we are digressing, let’s be positive: there was no lithium-battery smoke-filled cabin. Mainly, what a wonderful essay. I grew up in Cleveland in northern Ohio and I too remember snow in January. To honor all that imprinting, this week I am going to read snow-books at a five-year-old’s pre-school — “A Snowy Day,” “Snowflake Bentley,” “Owl Moon,” and “Stopping By Woods on a Snowy Evening.” And then we are going to cut out snowflakes and glue glitter on each one. Fran- I know I went on about how happy I was to leave winter and snow behind, but I have nevertheless collected a binder full of poems and snippets of fiction on those topics. The last paragraph of Joyce’s The Dead ends with “his soul swooned slowly as he heard the snow falling faintly through the universe, and faintly falling, like the descent of their last end, upon all the living and all the dead.” I found myself reciting those words softly into the snowy night. & what could be better than cutting out snowflakes and reading books with a pre-schooler? Annie….your words are without a doubt captivating, thought provoking and cause visuals that bring the snow globe a reality. Squinching snow is the exact sound. I found myself…although sitting in my BLUE chair in Mesa…in Philadelphia living room filled with pictures, stories, tears and family…or one word…love. with your heart felt words I was there. Thank you. I wept. And laughed. Thank you, darling. I’ve missed you. Patty- there is such a sweetness in the returning- burying my face in My Beloved’s neck and breathing him into me, the sweetness of knowing that I was missed. Thank you, darling. It is good being back. You wept, your readers weep. Thank you Anna for such a deeply moving glance into the inner soul of your past, so poetic, no wonder you’re the intellectual-on-site. Whew! “the unmistakable V pattern of Canada geese unzipping the soft grey belly of the winter sky, loosing–snow!” A literary masterstroke!